You are here: Home / Bez kategorii / Are We Actually Seeing? 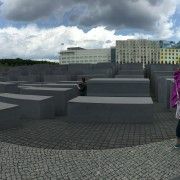 Being in Berlin, a significantly historical city and now the booming capital of Germany, I began to think about how many people are truly aware of their surroundings. I realize that I can be greatly unaware of my surroundings, as evident by the inevitable event of my running into any nearby desk or table. Like myself, I believe that a majority of people go through life with a sense of unawareness. While my running into table is a trivial example of unawareness in society, it appears that many a people live without questioning surroundings and information presented to them. This sense of obliviousness does no solely exist in the physical sense, for it appears that a great deal of this unawareness is rooted in the metaphysical as well. 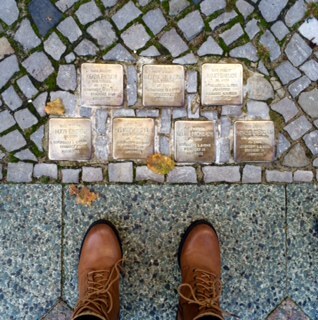 During our walk through the Bavarian quarter of the city, an area which was once the home to a significant number of German-Jewish individuals, I began to think about how many of the current individuals living in this portion of the city are aware of this area’s history. 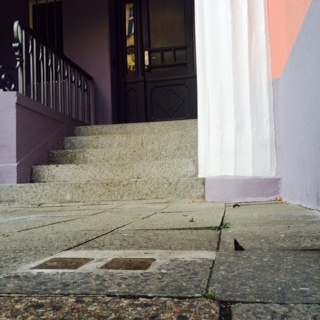 As you walk through the residential streets of the quarter, placed within the sidewalk are brass stepping stones providing passerby with information pertaining to the areas prior residents. Due to the fact that I and my group members were actively searching for these stones, we were able to find a great deal of them, however, had we not been on a quest to find them, I surely would not have noticed them. As a result, I began to question whether current residents of these building have noticed these incongruities in the sidewalk. 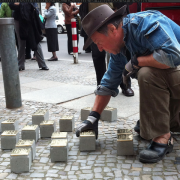 While reading the information of grouping of stepping stones, a woman passing by noticed our congregation around the stones and seemed puzzled. Upon reflection, I believe that the woman who passed by us had likely never acknowledged the existence of these pieces of memory, and thus was surprised by our attention to them. This incident certainly added depth to my ongoing question of as a society, how aware of our surroundings are we? Visiting the memorials dedicated to the victims of the Holocaust, a sense of unawareness amongst many of the other visitors appeared evident. 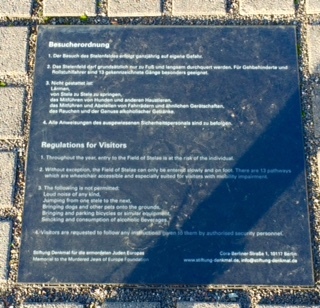 Situated outside the memorial dedicated to the Roma and Sinti victims is an informational panel explaining the layout and context of the site. Following the information, the panel asks that visitors refrain from throwing coins or other materials into the reflective pool. And of course, what could you see when looking into the reflective pool, coins of numerous currencies. Whether the presence of coins within the pool is a result of neglect to rules or one’s own surroundings, I feel that this instance truly says something about the society in which we live today, for people are either subconsciously or deliberately ignoring the surrounding world. 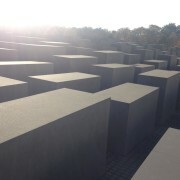 Finally, the epitome of unawareness I observed in Berlin, occurred at the Memorial to the Murdered Jews of Europe. Surrounding the memorial are numerous plaques requesting that visitors abstain from using loud voices and jumping on the concrete pillars. 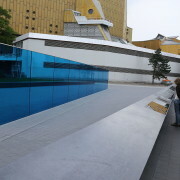 Continuing the theme from the Memorial to the Sinti and Roma Victims of National Socialism, what one sees at this memorial is quite different than the request. Rather than serving as a place of reflection, the memorial serves as a makeshift corn maze and playground for many. I found myself getting progressively angrier during our visit to this monument, not because of the behavior I witnessed but because I believe I found the answer to my ongoing question. After finding the answer to this ongoing question that had been plaguing my mind, my subsequent thoughts pertained to finding a solution to our society’s dilemma. 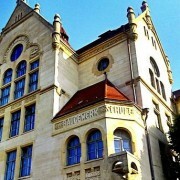 Fortunately, a previous stop during our Berlin trip provided a potential beginning to this solution. Our tour guide at the Topography of Terror stressed the idea that we need to be critical of information presented to society. Using photos of the Holocaust and World War II that are known to many, our guide demonstrated that we have to question not only our surroundings but also any information presented to us. In the context of Holocaust photos, he illustrated that these images have been carefully constructed by the perpetrators themselves, and so we must be weary of the information being obtained. An application of our guide’s advice to be questioning of the world in front of you could perhaps help to improve society’s sense of obliviousness. 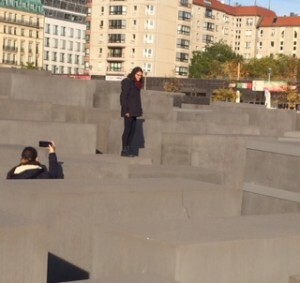 Our trip to Berlin has made me realize that as a society, many people go through life in a sense of obliviousness. As a result of this trip, I am further aware that my own unawareness extends much further than the physical sense, I now know that I was also unquestioning of most information presented to me. As a result of my observances, I am going to try to open my eyes to the rest of the world, and hope that other will join me to ultimately create a society that is more critical and aware of the surrounding world.